COLOGNE, Germany (DLR PR) — Space missions are a bit like a marathon with checkpoints – only once the first model of a satellite has been successfully tested will construction commence on the actual flight model. The Eu:CROPIS satellite developed by the German Aerospace Center (Deutsches Zentrum für Luft- und Raumfahrt; DLR), which will operate two greenhouses under Martian and lunar conditions, has now reached this milestone – construction of the flight model can now begin. The finish line is already in sight: launched by Space-X, the satellite and its scientific payload will take off for outer space on board the Falcon 9 in the second half of 2017. “We will be constructing the model here at DLR Bremen until spring 2017, and then conduct rigorous flight tests,” explains engineer Hartmut Müller, Project Manager for satellite construction at the DLR Institute of Space Systems. During its mission, the Eu:CROPIS satellite is designed to rotate at an altitude of 600 kilometres, initially replicating lunar gravity for a period of six months before simulating Martian gravity for the next six months. During this period, tomato seeds will germinate and produce small cosmic tomatoes under the watchful eye of 16 cameras. Key helpers that enable this growth will also be transported into space: first, an entire colony of microorganisms inhabiting a trickle filter will convert synthetic urine into easily digestible fertilisers for the tomatoes. Second, the single-cell organism euglena will also be on board to protect the hermetic system from excessive ammonia and to deliver oxygen. LED light will be used to provide the day/night rhythm that the euglena and tomato seed require. 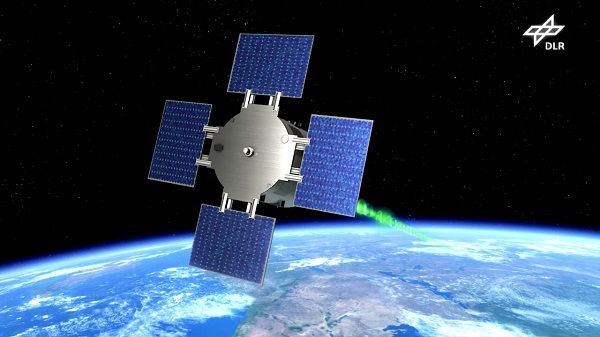 A pressure tank will replicate the Earth’s atmosphere. 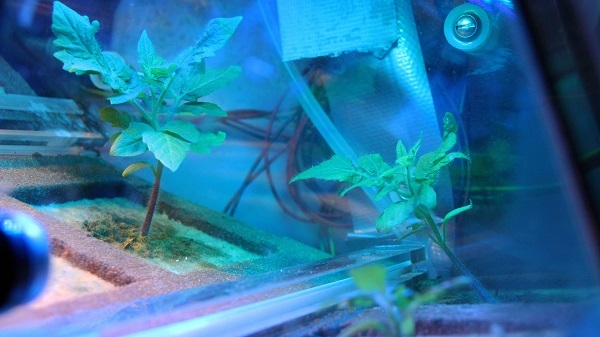 “Ultimately, we are simulating and testing greenhouses that could be assembled inside a lunar or Martian habitat to provide the crew with a local source of fresh food. The system would do this by managing the controlled conversion of waste into fertiliser,” says DLR biologist Jens Hauslage, head of the scientific part of the mission. In a lunar habitat, for instance, the greenhouse would be located in the astronauts’ ‘home’ in a simulated Earth atmosphere. Urine would be one of the waste products the astronauts would produce in abundance. Here, the plants would have to adapt to reduced gravity conditions – the gravitational pull on the Moon is approximately one sixth of what it is on Earth, and on Mars it is around one third. This is why the lava stones fitted in the trickle filter will initially be ‘infected’ with dried soil before Eu:CROPIS is sent off on its journey. This inoculation will allow a variety of organisms to settle in the porous, expansive surface of the lava stone, which they will use as a habitat. Once it reaches space, synthetic urine mixed with water will be trickled on the habitat every two to three days, triggering a true competition for food between these microorganisms. Here, nitrite is used to convert the harmful ammonia into nitrate, which is then added to the tomato seeds as fertiliser. Once Eu:CROPIS and its scientific payload have reached space, the first stage will be to activate the greenhouse that will simulate a lunar environment. During this phase, the satellite will be controlled by the DLR control centre in Oberpfaffenhofen (GSOC; German Space Operations Center), while the greenhouse will receive its commands from the DLR control centre in Cologne (MUSC; Microgravity User Support Center). The trickle filter, with its ravenous inhabitants, will be operated by the DLR Institute of Aerospace Medicine, and the Friedrich-Alexander-Universität of Erlangen-Nürnberg will contribute the euglena. The second greenhouse with Martian gravity will be activated six months later: by then, the microorganisms, tomato seeds and euglena will have been exposed to cosmic radiation for six months – the equivalent to a flight to Mars. The DLR Institute of Aerospace Medicine will measure the radiation exposure inside and outside the satellite throughout the entire mission. “We are using Eu:CROPIS to space test technology for use in habitats on other celestial bodies, but it could be installed just as well in a terrestrial setting,” Hauslage. For instance, trickle filters can be fitted to make manure more effective and less odorous. Recycling urine in conurbations, for instance in greenhouses installed in high-rise buildings (vertical farms), would be another possible use. why cant they recreat conditions on earth? Because you can’t create a lower gravity on earth over long periods of time. You can do parabolic flights but that’s about it. To examine growth of plants in low gravity over long periods you need to go into space. One good thing is that the experiment will work, since probably any gravity will work the experiment. Can be tested many times. The plants may grow too much up and not enough sideways. May need new varieties. 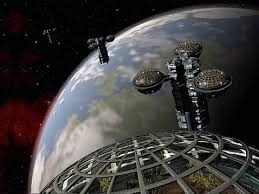 I hope to see them growing in a greenhouse on a continuous sunlight spot on the Moons poles. Dark for 2 weeks is bad. The Kibo module on the ISS has a small centrifuge where experiments have been run. Is it big enough to run mice or is it just a small one devoted to botony, microbes, etc? Great to hear about this mission and also to hear that SpaceX has the launch contract. SpaceX only exists because Elon was frustrated in his initial ambition to put a small greenhouse on Mars by a lack of affordable lift. I haven’t seen that movie in forever — what’s “Laufruhe”? I think he means, why can’t they do 1g? In that case, the answer would be that they probably could, though perhaps at additional expense, but we already know how plants grow in 1g. That’s not exactly the same as an completely closed system in a radiation environment with a gravity gradient (only 1 distance from the center of rotation would be exactly 1g), but the bigger questions are how would plants grow on the Moon or Mars. This kind of experiment helps us start to learn the answers without the expense an complications of going all the way to soft touchdowns of greenhouses on the surfaces of the Moon and Mars. It is called the Cell Biology Experiment Facility (CBEF), it was designed to be big enough for mice and some experiments on mice have been done, but as far as I can tell they have primarily studied cell growth and small plant growth. There’s not much information on it in English, unfortunately. NASA’s pages on the Mouse Habitat and about the CBEF are frustratingly brief. Thanks for the reply and up-vote, therealdmt, “Laufruhe” was the German I was given as the translation of “silent running”. I reversed the translation and got the result of “smooth running”. I guess the German reasoning is if something is running smoothly, it is running silently. This is a similar situation I encountered when we had to employ a Japanese translator for a large Japanese tourist study we analysed many decades ago. The translator explained that when we in English say we our seeing a beautiful view through a window, the Japanese can express this as literally in English they are seeing a beautiful picture. Broadens the mind. Regards, Paul.